Flex-A-Bed Premier Features The Flex-A-Bed Premier has a lifetime warranty. Every option Flex-A-Bed offers is available with the Premier model, which is fully customizable and handbuilt to your specifications by expert craftsmen in the U.S.A. The deluxe mattress is made with premium fabrics and plush top comfort. Customers may choose from deluxe innerspring construction in soft, medium firm and extra firm. The Flex-A-Bed Premier s mattress is also available in memory foam, latex or a combination innerspring/memory foam option. Available with optional single or dual-timed massage. The perfect sleep position for the head and feet is within reach with easy to use hand controls and the Flex-A-Bed Premier s Swift-Adjust Motors. The Premier model attaches to your existing headboard to match their decor. We also include a mattress retainer cover for the foot of the bed. The Flex-A-Bed Premier is available in twin, full, queen, dual queen, king, dual king, California king &#8220; all in various lengths. The height of the Flex-A-Bed Premier can be customized from 19 to 30 inches. The Premier model comes standard with a high-density foam foundation and heavy-duty base made with Advantech material that will not warp, break or squeak. Flex-A-Bed Value-Flex Features Every Flex-A-Bed Value-Flex is hand-built by expert craftsmen in the U.S.A.
Flex-A-Bed Hi-Lo Features Every Flex-A-Bed Hi-Low is hand-built by expert craftsmen in the U.S.A. and comes with a limited five-year limited warranty. The perfect bed height and sleep position for the head and feet are within reach with one, easy to use hand control. The Hi-Low model can be easily adjusted from 26 to 32 inches. For people who require even lower heights, the Hi-Low can be customized to adjust from 24 to 30 inches. You may choose from soft, medium and firm innerspring mattress construction. The Hi-Low model is available with, or without a mattress. The Flex-A-Bed Hi-Low comes standard with a high-density foam foundation and heavy-duty base made with Advantech material that will not warp, break or squeak. The Hi-Low model is available in twin, full, and queen, in 80 and 84 inch lengths. The Hi-Low model can easily be paired with a Flex-A-Bed Premier or Value-Flex &#8220; perfect for a spouse not requiring Hi-Low functionality. 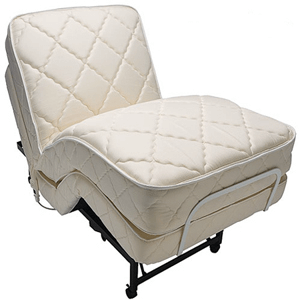 Every Flex-A-Bed Hi-Low comes with locking casters to prevent unwanted bed movement. Many purchasers of the Hi-Low model find the optional side rails a perfect compliment to their needs.